Scotch eggs, a popular picnic snack in the UK, is also available as Deviled eggs in many British-era clubs in India. Boiled eggs are cooped in a “jacket” of bacon or sausage and meat, which are then fried golden crisp with breadcrumbs. London-based luxury department store Fortnum & Mason stakes claim to the invention of the scotch eggs recipe in 1851. 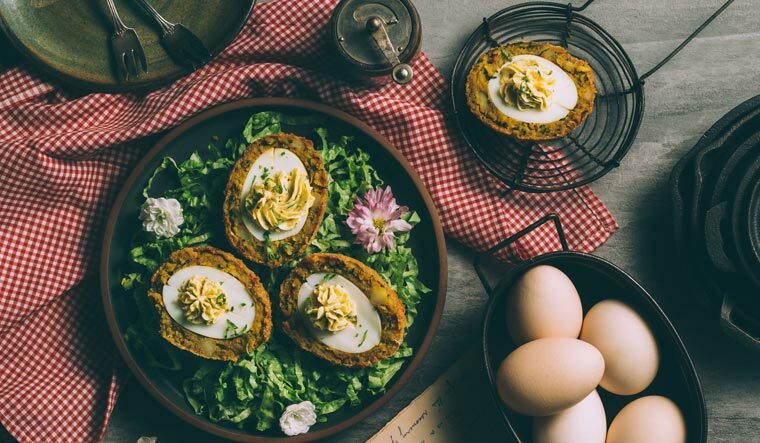 But it is also widely believed that the British colonial masters in India were inspired by the famous Mughal dish Nargisi Kofta—where the hard-boiled egg would be swaddled in spicy minced meat and cooked in a curry—when they were dishing out scotch eggs. At Delhi's newly opened restaurant Anglow, an Anglo-Indian themed Whiskey bar and kitchen, scotch or deviled eggs is available in variations of mashed potato, cottage cheese, bacon and cheese, sausage meat and spicy lamb. "We are not trying to serve food cooked in the kitchens of many Anglo-Indian families like that of Goa or Calcutta. Our flavours and inspirations are derived from a time when the Britishers were here and they had to tweak the food to suit their palate. You will still find these dishes in colonial institutions like gentleman’s clubs, railway kitchens and army messes " says Ajit Singh, co-founder of Anglow with Arpan Gupta. Singh's father was in the Indian army and he has grown up eating old-world delectables like Tipsy Pudding, Deviled eggs, pineapple cherry sticks and open cheese toasts. "Let us say the way Britishers had shammi kebabs at Wenger's and Delhi Gymkhana Club or how they reinterpreted the khichdi into kedgeree which is made of rice, butter, herbs and flaked fish sans the pulses, " Singh adds by way of examples. The Anglo-Indian community, now struggling to retain their distinct identity, is a legacy of the British rule in India. They straddle the line that marks the coloniser from the colonised and trace their origins from contacts between Europeans and Indians. But they are more distinct as Britishers living and working in India between 18th and 20th century. Their cuisine is a reflection of this cultural intermingling and reinterpretation of Western habits of eating. Says Bridget White-Kumar, author of six Anglo-Indian cookbooks, "The British did not like Indian food and taught their khansamas (cooks) to prepare dishes from their own hometowns. However, over a period of time, a few local ingredients were added to the dishes, and they experimented with making puddings and sweets using local ingredients. Their soups were seasoned with cumin and pepper, roasts were cooked in whole spices like cloves, pepper and cinnamon, and rissoles and croquettes flavored with turmeric and spices. Mulligatawny Soup, Meat Jalfraze, Devilled beef and pork were some of these early innovations, " in an essay titled 'Preserving Colonial Flavours'. Today, it is not very easy to find exclusive Anglo-Indian restaurants, especially Delhi had none after Gaylord. Kwality has re-opened after extensive renovations with a menu titled to revive Anglo-Indian mainstays like Veg Au Gratin and Chicken a la Kiev. Singh reminiscences his childhood days, hopping over to the now-shuttered conti-diner Gaylord in Connaught Place for Baked Alaska. "Think of Gaylord as a point of reference here. Only, this a casual pub instead of a fine-dining establishment with some very interesting whiskey cocktails," says Singh to further illustrate his analogy. Anglow's extensive menu includes the beloved Shammi Kebabs and Railway Mutton Curry, inspired by and first served in the first class compartments of the then British Indian Railways. The kitchen also serves up Kedegree, assorted roasts, soups to Dak Bungalow Curry and mains like Country Chicken Stew, Vindaloo and desserts like Tipsy Pudding and Crème Brûlée. Their cocktails only add to the old-fashioned chic, with classics such as The Gibson, GNT (Gin and Tonic) and Sidecar to in-house specialties like Anglow Spice, King’s Derby and Coffee Train.